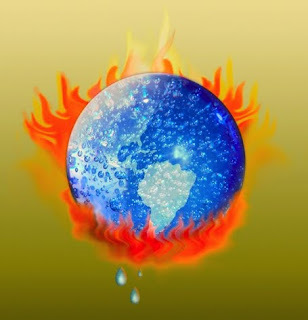 Global warming is the increase in the average temperature of Earth's near-surface air and oceans since the mid-20th century and its projected continuation. Global surface temperature increased 0.74 ± 0.18 °C between the start and the end of the 20th century The Intergovernmental Panel on Climate Change concludes that most of the observed temperature increase since the middle of the 20th century was caused by increasing concentrations of greenhouse gases resulting from human activity such as fossil fuel burning and deforestation. The IPCC also concludes that variations in natural phenomena such as solar radiation and volcanism produced most of the warming from pre-industrial times to 1950 and had a small cooling effect afterward. These basic conclusions have been endorsed by more than 40 scientific societies and academies of science, including all of the national academies of science of the major industrialized countries. An increase in global temperature will cause sea levels to rise and will change the amount and pattern of precipitation, probably including expansion of subtropical deserts. Warming will be strongest in the Arctic and will be associated with continuing retreat of glaciers, permafrost and sea ice. Other likely effects include increases in the intensity of extreme weather events, species extinctions, and changes in agricultural yields. Political and public debate continues regarding global warming, and what actions if any to take in response. The available options are mitigation to reduce further emissions; adaptation to reduce the damage caused by warming and, more speculatively, geoengineering to reverse global warming. Most national governments have signed and ratified the Kyoto Protocol aimed at reducing greenhouse gas emissions. Posted by Roberto Armendariz Rovello at 5:29 p.m.
HugFab January 5, 2010 at 7:36 a.m.
Nice topic , but what do you need to say about it??? What is your state upon this topic! !